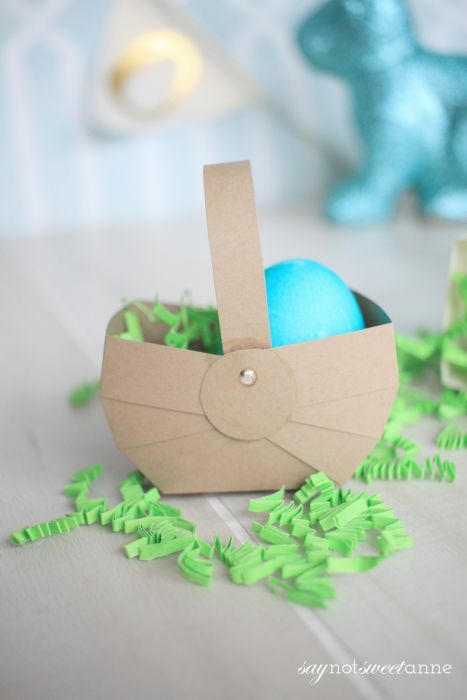 I saw this wonderful paper basket post from 2009 on The Little Blue Room, and thought it was SO CUTE! 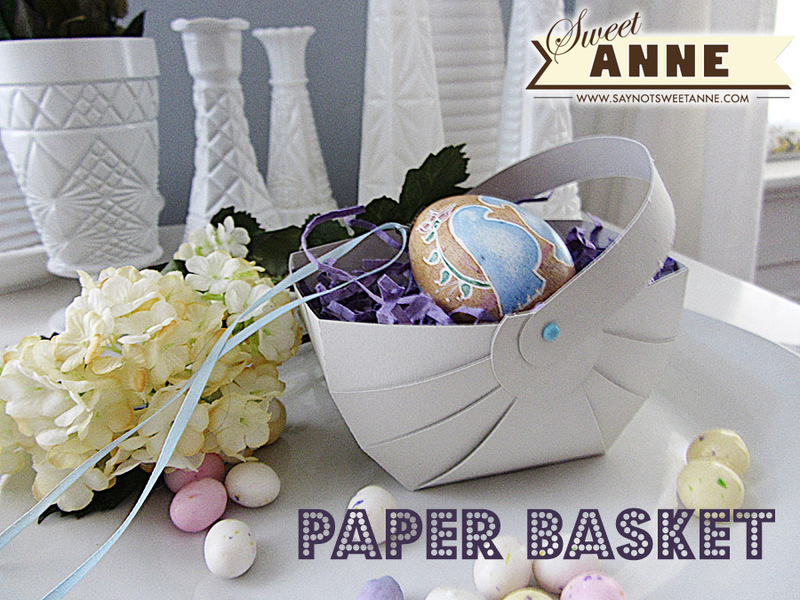 So, the next step was to make a cutting file for the paper basket, so that I could make multiples in a flash for Easter. And the step after THAT is sharing them all with you. 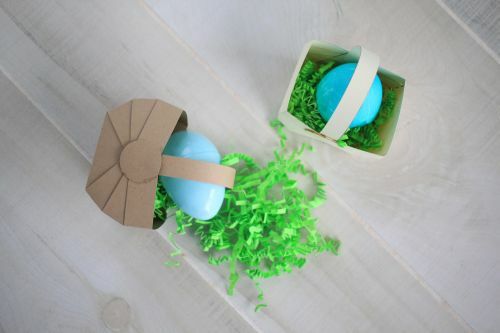 These sweet little baskets don’t just have to be for eggs though. Imagine them as little baby carriers for a baby shower favor, or sweet little harvest baskets for Thanksgiving! You could fill them with red candies for an apple themed teacher gift too. 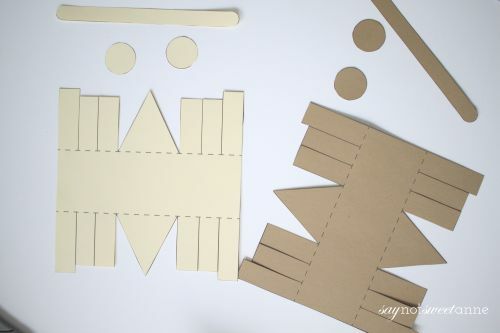 The free printable template, or the Silhouette cut file make it easy to create several of these, and assembly is a total breeze. You could use brads, or just glue the handles on depending on the time or your specific use. Once you have your parts all cut, it is time to assemble. (Note: Rachel from The Little Blue Room chalked the edges of her paper for more dimension. I like mine more “clean”) Start by taking the two longest strips from one side and gluing those together. Then, layer the next two (one from each side,) and finally the last two. Repeat for the other side. Once those tabs are dry, glue the triangle up to complete the side. 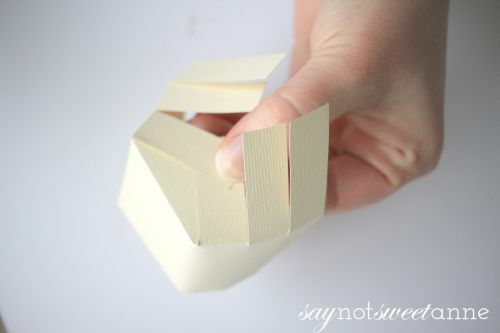 Then, glue a circle on top (folded in half) to disguise any nasty edges. Repeat on the other side. Thread your brad through the handle and then the basket. Repeat on the other side. That’s it! I hope everyone has a fantastic Easter- I know I will! Enjoy time with your loved ones! Danielle, I’m glad you like it! Can you be more specific about what issues you’re having with the SVG? Remember, to download the file you mist right-click and select “Save link as…” otherwise you get a bunch of code in your browser. ;D Let me know what I can do to help! Love it, love it, love it! I’m pinning and sharing on my FB page today (a rather belated “A Little Birdie Told Me…” feature). Hope you had a wonderful Easter holiday! I found this on Pinterest and it’s so sweet of you to offer the file.The problem is cricut cuts on all the lines making individual rectangles and triangles. Perhaps the center lines should be perforated. Which of the files are you referring to? In the SVG the center lines are dashed. I don’t own a cricut so I’m not sure why that doesn’t work? very cute basket and thanks for sharing the file! Hi there! This is soooo adorable! Thank you so much for sharing the files…I read the previous comments, and I’m not sure if you were able to get more responses from the posters, but the SVG file does not work. It cuts a bunch of random lines and angles, but does not cut it out as one big shape. I don’t know if this was what others were experiencing? It saves and imports just fine, but the cuts do not work. Dying to try it out! No one answered back about the Cricut. Like I mentioned, I don’t own one so there is no way for me to troubleshoot it. =C Is there a program you typically open them with that will allow you to edit/fix it? I’ll be happy to upload a new version for cricut users if there is one that works. Merci pour ta gentillesse de nous partager ce beau petit panier. Il est magnifique, j’adore le scrap et je pourrais facilement passer mes journées à regarder le travail de gens comme toi. J’en fais aussi et j’aime tellement ça. Encore une fois, merci pour tout. Merci! Je suis content que vous l’aimez. I would like to cut out the paper basket on my cricut machine. Unfortunately the file will not work. Instead of scoring all the fold lines, it cuts them. I have put my pressure down to low and my blade down to 3 and it cuts right through. What can I do to prevent this. I’m glad you like it! Unfortunately, I do not know anything about the Cricut machines. Do they have software to transfer the file to the machine? With the Silhouette I can change certain lines to “no cut” in the software. Can you try importing the PDF instead of the SVG? Thank you so much for the cut file. I made these last year from another website I had pinned and cut them all by hand. Much quicker with the cut file. Thanks again they make beautiful baskets to put a few little easter eggs in. 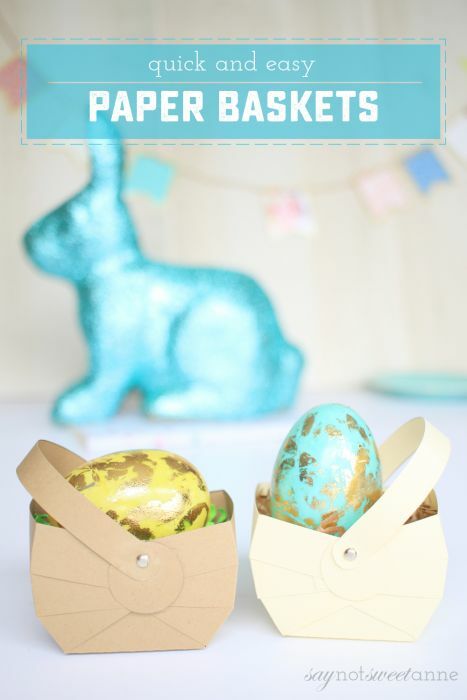 Pingback: 15 Paper Easter Baskets to Make (with free cut files!) | Whatcha Workin' On? Aww, I’m so glad you like it Dee! Thanks for the free downloads. I have the Cricut Expore air 2. The svg file downloads great, but cricut users once they have downloaded the file, saved it and then uploaded to design space they have to attach it and then change the cut lines that go down in the center of the basket to score. After this is will cut perfectly. Ginger – thanks SO MUCH for that info! I have the Silhouette Cameo and Curio – so I wasn’t sure what all happened in Cricut world. Thanks!